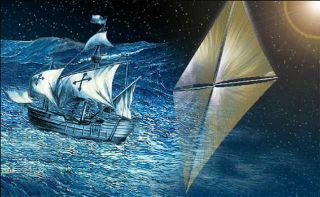 An artist's concept of a sailing ship and a solar sail. Solar sails have long promised to harness sunlight for space exploration,just as early sailing ships harnessed the wind. Now the Planetary Society hopesto refit a NASA sail design and make a third U.S. attempt to fly the firstsolar sail in space. Never before has a vehicle successfully flown in space usinga solar sail as its primary means of propulsion. But it hasn?t been for alack of trying. The California-based Planetary Society attempted to fly its Cosmos-1solar sail in 2005, but it foundered because of a Russianrocket malfunction. Then NASA?s NanoSail-D was lost in the third failedflight of SpaceX's Falcon 1 rocket in 2008. Japan managed to deploy solar sail materials from a sounding rocket in2004, but did not attempt to demonstrate controlled flight. The PlanetarySociety?s new venture could combine technologies and lessons from both earlierspacecraft. "In Cosmos-1 we had a more conventional spacecraft, but thetechnology has moved ahead now," said Louis Friedman, executive directorof the Planetary Society in Pasadena, Calif. "You can actually get ahigher performance sail with a lower mass spacecraft." NanoSail-D may provide the foundation design for that future, smallerspacecraft. The sail was meantto test both solar wind pressure and Earth?s atmospheric drag, but lackedactual maneuvering capabilities for controlled solar sailing. By contrast,Cosmos-1 had a radio system, imaging system and a micro-accelerometer to enablecontrol over the spacecraft. NASA has backup NanoSail-D hardware in storage on Earth and a PlanetarySociety working group could make a decision by the end of summer on how best tointegrate that design with its goals. Any future design may also comesignificantly cheaper than the roughly $4 million price tag on Cosmos-1. "If we can reduce it by half, we'd be pretty happy," Friedmantold SPACE.com. However, he added that the size reduction would not comewith performance reduction, and expects acceleration "at least as good andmaybe better" compared to Cosmos-1. That equal or better speed boost becomes possible because accelerationis proportional to area divided by mass, and so a smaller spacecraft mass canmake do with a smaller sail. Another mini-sail suggestion for the PlanetarySociety comes from Russian researchers at the Space Research Institute inMoscow, who also collaborated on Cosmos-1. A smaller-sized solar sail also opens up new launch possibilities,ranging from the Russian Soyuz rockets to private launch firms in the UnitedStates and elsewhere. The sail could likely hitch a ride as a secondarypayload, similar to the smaller cubesat missions which have allowed scientiststo launch numerous experiments into space. Ideally, a companion spacecraft could also launch with the solar sailand watch while the sail unfurls, Planetary Society officials said. That wouldalso provide researchers with valuable data on how the thin, gossamer-like sailstructure behaves in microgravity. Figuring out how solar sails operate in space could eventually lead tospacecraft which maneuver as confidently as sailing ships on Earth, and evenallow for sailing or "tacking" into the face of the sun's oncomingsolar wind. The new endeavor may still face some friendly competition from a Finnishsolarsail concept under development. That solar sail uses a slightly differentconcept of electrical charge repulsion, which takes advantage of charged solarparticles. Planetary Society officials have said they plan to announce the resultsof their feasibility study once this summer?s analysis of NASA?s spareNanoSail-D and Russia?s mini-sail concept is complete. Video- Star Trek's Warp Drive: Are We There Yet?